Listening to the song and working with vocabulary for Spanish students. This activity was done with the purpose to explore the vocabulary and the listening. This is a very well-known song by Robbie Williams. Sts can watch the video, comment on it with some warm-up questions,then choose the words to complete the song from options, decide the right order for the chorus, find synonyms in the lyrics, and they can also look for some information about the singer. I hope you find it useful. 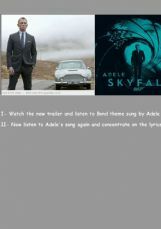 This is a listening comprehension exercise with Adele singing the last Bond theme. I�m sorry, I had problems with the second video so we can�t see the activities on the preview but they are a little under. This is one of my favorite songs. Hope it�s useful for your students. Liza Minnelli and Joel Grey sing the world famous duet from "Cabaret". A great song from an extraordinary film. You should watch it. I love this movie, and I especially love this song! The activities are very simple; in fact, they are just an excuse to use the song! :-) As Mr White says, "That thing you do is snappy!" I�d appreciate your feedback.